jhana: Absorption in a physical sensation (rupa jhana) or in a mental notion (arupa jhana). Vitakka (directed thought), vicara (evaluation), and piti (rapture) are three of the five factors forming the first level of rupa jhana, the other two being sukha (pleasure) and ekaggatarammana (singleness of preoccupation). Definition: Noble one. An arahant is an individual who has realized Nibbana, brought an end to his own suffering and the cycle of birth and death. Buddhism originated in India, and is one of the three major religions of the world. Buddhism, introduced to China during the latter period of the West Han dynasty and the early period of the East Han dynasty, was based on the teachings of its Great Teacher, the Buddha Sakyamuni. Sakyamuni means holy man of the Sakya clan. He was born on April 8, 565 B.C., and was named Gautama Siddhartha (563-483 BC). The basic form and concepts of Buddhism have changed greatly over time. Today, there are many sects, or schools of thought, but they are not mutually exclusive or hostile towards one another. There are many misunderstandings with regard to Buddhism. Buddha is not a god but a human being who claims no divine powers. In Buddhist philosophy, human beings are considered their own masters ande gods are irrelevant. Reincarnation is also misunderstood. It is not considered desirable in Buddhism to be reborn into the world. Since all life/existence is suffering, one does not wish to return to this world. One hopes to escape the endless cycle of rebirths by reaching nirvana. Classical Buddhists will not kill any creature and are therefore strict vegetarians. They believe that committing suicide in an attempt to avoid life’s sufferings will only bring more bad ‘darma’ and result in rebirth at a lower level. However, there are other sects that hold opposite views. For example, during the Vietnam War, the South Vietnamese Buddhists made world headlines by publicly burning themselves to death to protest government policies. Somehow, the various sects of Buddhism manage not to clash with each other. Buddhism reached China around the 1st century AD and became its prominent religion by the 3rd century. Strangely, while Buddhism grew in east Asia, it declined in India. Buddhism in China is mixsed with other Chinese philosophies such as Confucianism and Taoism. The Chinese, in particular, had a hard time accepting the fact that they should not desire to return to this life, as they believe in longetivity. As many as 13 schools of Buddhist thought developed in China, the most famous, perhaps, being Chan, which is usually known in the west by its Japanese name, Zen. Buddhism was founded partly as a reaction to Brahmanism. Born as a prince, Siddhartha lived a life of luxury during his early years, but later, confronted by the sights of old age, sickness and death, became disillusioned with this existence. At the age of 29 he left home and began to search for a solution to the physical body’s inescapable subjection to weaknesses. Supposedly, at the age of 35, Siddhartha sat under a banyan tree and in a deep state of meditation, attained enlightenment. He was thereafter known as the “enlightened one.” It is also said that Gautama Buddha was not the first buddha, but the fourth, and he was not expected to be the last. The main belief in Buddhist philosophy is that all life is suffering. The cause of suffering is desire-the desires of the body and the desire for personal fulfillment. Happiness can only be achieved if these desires are overcome, and this requres following the ‘eight-fold’ path. Following this path will lead one to nirvana. The sutras, the Buddha’s discourses, say that nirvana is a state of complete freedom from greed, anger, ignorance and the other various chains of human existence. The first path of the eight-fold path is ‘right understanding’: the recognition that life is suffering, that suffereing is caused by desire for personal gratification, and that suffering can be overcome. The seond path is ‘right mindedness’: cultivating a mind free from sensuous desire, evil deeds, and cruelty. The remaining paths requre that one refrain from abuse and deciet; show kindness and avoid self-seeking in all actions; develop virtues and curb passions; and practice meditation. The Buddha instructed the famous 16 arahants and his two attendant-disciples, Maha Kassapa and Ananda, to propagate his teachings to the world and share them with other living beings. 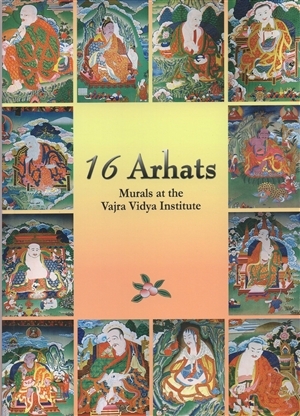 After Buddhism was introduced to China, the 16 arahants became the subjects of artists. Later they became the 18 arahants. An arahant is a person who could dissolve the burdens of his corporeal existence, attain the state of nirvana, and be liberated from cyclic existence. He has attained the highest level of cultivation, and possesses the moral integrity to guide living beings towards goodness. Thus, an arahant is a holy person venerated by men and gods. During the Ming dynasty, the most number of Buddhist preachers to Taiwan came from the Lin Chi School of China’s Yung Chuen Temple at Ku Shan, Fu Chow. Until the early part of of the Ching Dynasty, the Ch’an (Zen) Buddhist tradition, especially the Lin Chi School, was most popular, followed by the Chao Tung School. Buddhist cultivation in Taiwan maintained the dual practice of Ch’an and Pure Land traditions, complemented by the Vinaya tradition. Later, Buddhism in Taiwan was divided into seven different schools: Pen Yuen, Shan Hui, Miao Chan, Chie Li, Chie Yuen, Yi Min, and The Yuen. There is also another version with three schools: the Huanyin Shan School of Master Pen Yuen, the Yue Mei Shan School of Master Shan Hui, and Fai Yin Temple School of Master Chie Li. After Taiwan Retrocession, Master Shan Hui worked on forming a Buddhist association. In 1946, the Buddhist Associatin of the ROC was established. The Association sought reforms on the integration of classic Taiwan Buddhist practices; consequently, temples in different places opened their doors and began accepting practitioners. Furthermore, Buddhist colleges began to emerge. In 1960, the first Buddhist society was formed. Until 1981, there were 48 Buddhist societies in Taiwan. Buddhism reached its height in India by the 3rd century BC, when it was declared the state religion of India by the emperor Ashoka. It declined sharply after that as a result of a factionalism and persecution by the Brahmans. Numerous Buddhist sects have since evolved in different parts of the world. Buddha’s father was King Suddhodana. His mother, Queen Maya, gave birth to Siddhartha after dreaming of a white elephant on a lotus. The queen died seven days after giving birth. According to legends, many auspicious signs were present when Prince Siddhartha was born. Immediately after he was born, the Prince walked seven steps, and a lotus appeared on each step. He pointed one hand to the sky, and one hand to the ground uttering, “Foremost am I in the world. “ After saying this, he became an ordinary baby boy. He was married to Yasodhara when he was 16, and the couple bore a son, Rahula. When Siddhartha was 29, he left the palace one night on his borse and proceeded on a southeastern direction, thus beginning his search for a peaceful, quiet, and solemn life. Siddhartha first studied meditation under Alara Kalama; he then studied a different kind of meditation under Udraka Ramaputra. After six years and being dissatisfied with what he had learned, he left sadly, to practice extreme asceticism alone in the forest. He refused to eat and fell on the riverbank from physical weakness. Fortunately, a village girl passed by and revived him by feeding him cow’s milk. After regaining consciousness, Siddhartha swore under a Bodhi tree that he would never leave it until he found the way to resolve life’s miseries. After 49 days of meditation, on December 8, he became enlightened when the morning star appeared to him at dawn. He was 35 years old then. Since, he was referred to as the Buddha, The Awakened, Great Teacher, and the All Accomplished. He organized an order of monks, established a meditating ground, and went about India preaching his philosophy for 45 years. Siddhartha’s philosophy influenced the kings and aristocrats as well as the poor and beggars. As his teachings broke India’s racial and class discrimination, he can be considered a social reformer. He passed away at the age of 80 on February 15, 486 B.C. After his body was cremated, the ashes were divided into 84,000 portions and enshrined in pagodas in different categories for worshipping. According to legend, when Shakyamuni was born, fragrant flowers fell from the sky, and there was heavenly music all around. Two waterfalls appeared in the sky; one was lukewarm, and the other was cold. The waterfalls cleaned up the baby Buddha. All the gods cheered the birth of the Buddha. Thus was the origin of the ceremony of Buddha’s birth. Buddhists perform the ceremony of bathing the Buddha on the eighth day of the fourth month of the Lunar Calendar, when they bring vegetarian food to the temple and pray. The Lungshan Temple in the Wanhua district of Taipei performs the ceremony in its courtyard. On that day, prayers begin at 7am in the morning and continue throughout the day. During the ceremony, three small gold statues of the Buddha are immersed in fragrant water (water treated with licorice root) in a small basin. The monks, nuns, and devotees form a line to pass before the small statues and use a small ladle to scoop up the fragrant water and water the statues from the head down. In addition to cleaning the body of the Buddha, they believe that the water used in bathing can cure illness and promote longevity, so the faithful bottle the water and bring it home. Before Taiwan’s Retrocession (see Holidays or History sections of this website), the statues were taken out on a procession after the ceremony. The devotees paid homage to the statues along the way, and it was called “traveling icons.” Today, the practice is replaced with a big congregation in the different temples praying for peace and good fortune for all living things. During the Soong, Ming, and Ching dynasties, the Buddhists also practiced “auspicious binding” and “freeing the animals” on the same day. “Auspicious binding” refers to the Buddhist practice of rotating beans with the fingers while chanting the Buddhist sutra. The beans are then kept until the ceremony for bathing the Buddha. On that day, devotees cook the beans and offer the food to the monks. During early times in Taiwan, before the bathing ceremony, monks and nuns from different temples would go out and visit devotees to ask for the beans. This is one form of binding their auspicious relationship. It is believed that the act of freeing animals to save them from being killed on the day of the bathing ceremony surpasses the 10,000 spiritual merits earned in ordinary days. In recent years, however, some animals that were freed died from environmental pollution. The gesture effectively killed the animals that were meant to be saved; thus, Lungshan Temple does not perform the ceremony. Bathing the Buddha is an important practice observed by Buddhists all over the world. In Malaysia and Indonesia, where Islam is the primary religion, the day of the first full moon in May is a national day of commemoration (Wesak Day). Buddhists commemorate the three momentous events in Buddha’s life: birth, enlightenment, and passing into nirvana. One attracion in Kuala Lumpur is the night is the night procession. Floral carts made by Buddhists organizations are paraded by thousands of devotees on the streets. Every devotee holds a lotus flower candle on one hand, and a flag on the other. They chant the name of the Buddha for two to three hours. The procession passes by major streets in the city and ends with a mass prayer retreat. In the Buddhist country of Thailand, devotees go to a temple to chant sutras and offer lotus flower, incense, and candles to Buddha. Some people even buy small gold foils, circle them around Buddha’s golden statue three times, and paste the gold foils on the statue. In Korea, devotees busily prepare themselves for the Buddha’s birth ceremony right after New Year. Devotees go to temples and make lotus flower lanterns to embody their personal wishes. The hundreds and thousand of hanging lanterns brighten up the night. When I first went to study with my teacher, Ajaan Fuang, he handed me a small booklet of meditation instructions and sent me up the hill behind the monastery to meditate. The booklet — written by his teacher, Ajaan Lee — began with a breath meditation technique and concluded with a section showing how the technique was used to induce the first four levels of jhana. In the following years, I saw Ajaan Fuang hand the same booklet to each of his new students, lay and ordained. Yet despite the booklet’s detailed descriptions of jhana, he himself rarely mentioned the word jhana in his conversations, and never indicated to any of his students that they had reached a particular level of jhana in their practice. When a student told him of a recurring meditative experience, he liked to discuss not what it was, but what to do with it: what to focus on, what to drop, what to change, what to maintain the same. Then he’d teach the student how to experiment with it — to make it even more stable and restful — and how to judge the results of the experiments. If his students wanted to measure their progress against the descriptions of jhana in the booklet, that was their business and none of his. He never said this in so many words, but given the way he taught, the implicit message was clear. As were the implicit reasons for his attitude. He had told me once about his own experiences as a young meditator: “Back in those days you didn’t have books explaining everything the way we do now. When I first studied with Ajaan Lee, he told me to bring my mind down. So I focused on getting it down, down, down, but the more I brought it down, the heavily and duller it got. I thought, ‘This can’t be right.’ So I turned around and focused on bringing it up, up, up, until I found a balance and could figure out what he was talking about.” This incident was one of many that taught him some important lessons: that you have to test things for yourself, to see where the instructions had to be taken literally and where they had to be taken figuratively; that you had to judge for yourself how well you were doing; and that you had to be ingenious, experimenting and taking risks to find to ways to deal with problems as they arose. So, studying with him, I had to learn to take risks in the midst of uncertainties. If something interesting came up in the practice, I’d have to stick with it, observing it over time, before reaching any conclusions about it. Even then, I learned, the labels I applied to my experiences couldn’t be chiseled in rock. They had to be more like post-it notes: convenient markers for my own reference that I might have to peel off and stick elsewhere as I became more familiar with the territory of my mind. This proved to be a valuable lesson that applied to all areas of my practice. To gain insight into a state of concentration, you have to stick with it for a long time. If you push impatiently from one level of concentration to the next, or if you try to analyze a new state of concentration too quickly after you’ve attained it, you never give it the chance to show its full potential and you don’t give yourself the chance to familiarize yourself with it. So you have to keep working at it as a skill, something you can tap into in all situations. This enables you to see it from a variety of perspectives and to test it over time, to see if it really is as totally blissful, empty, and effortless as it may have seemed on first sight. The best state of concentration for the sake of developing all-around insight is one that encompasses a whole-body awareness. There were two exceptions to Ajaan Fuang’s usual practice of not identifying the state you had attained in your practice, and both involved states of wrong concentration. The first was the state that comes when the breath gets so comfortable that your focus drifts from the breath to the sense of comfort itself, your mindfulness begins to blur, and your sense of the body and your surroundings gets lost in a pleasant haze. When you emerge, you find it hard to identify where exactly you were focused. Ajaan Fuang called this moha-samadhi, or delusion-concentration. The second state was one I happened to hit one night when my concentration was extremely one-pointed, and so refined that it refused settle on or label even the most fleeting mental objects. I dropped into a state in which I lost all sense of the body, of any internal/external sounds, or of any thoughts or perceptions at all — although there was just enough tiny awareness to let me know, when I emerged, that I hadn’t been asleep. I found that I could stay there for many hours, and yet time would pass very quickly. Two hours would seem like two minutes. I could also “program” myself to come out at a particular time. After hitting this state several nights in a row, I told Ajaan Fuang about it, and his first question was, “Do you like it?” My answer was “No,” because I felt a little groggy the first time I came out. “Good,” he said. “As long as you don’t like it, you’re safe. Some people really like it and think it’s nibbana or cessation. Actually, it’s the state of non-perception (asaññi-bhava). It’s not even right concentration, because there’s no way you can investigate anything in there to gain any sort of discernment. But it does have other uses.” He then told me of the time he had undergone kidney surgery and, not trusting the anesthesiologist, had put himself in that state for the duration of the operation. In both these states of wrong concentration, the limited range of awareness was what made them wrong. If whole areas of your awareness are blocked off, how can you gain all-around insight? And as I’ve noticed in years since, people adept at blotting out large areas of awareness through powerful one-pointedness also tend to be psychologically adept at dissociation and denial. This is why Ajaan Fuang, following Ajaan Lee, taught a form of breath meditation that aimed at an all-around awareness of the breath energy throughout the body, playing with it to gain a sense of ease, and then calming it so that it wouldn’t interfere with a clear vision of the subtle movements of the mind. This all-around awareness helped to eliminate the blind spots where ignorance likes to lurk. This was why, as long as your awareness was still and alert all-around, it didn’t matter whether you were in the first or the fourteenth jhana, for the way you treated your state of concentration was always the same. By directing your attention to issues of stress and its absence, he was pointing you to terms by which to evaluate your state of mind for yourself, without having to ask any outside authority. And, as it turns out, the terms you can evaluate for yourself — stress, its cause, its cessation, and the path to its cessation — are the issues that define the four noble truths: the right view that the Buddha says can lead to total liberation.